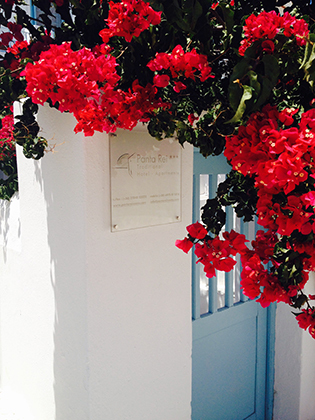 In the Kastro area, the heart of the oldest part of Parikia, capital and main port of Paros Island, you will find the charming place PANTA REI*** TRADITIONAL HOTEL-APARTMENTS. Panta Rei is a traditional aparthotel renovated in 2016 by the owners Yannis and Emanuela, his wife, who is an architect herself. Yanis is greek, Emanuela italian, they met each other in this “domatia” and, after they bought it, they transformed this ancient guesthouse in a magic place where the dates of the most important events of their life gave the names to the accommodations. Emanuela and Jannis made the choice to preserve the original stonewalls and now the place is offering an amazing view over the sea and over the old Kastro area. The local authorities have recently classified the building as protected because of traditional architectural interest. Island colors, simplicity, old furniture and a warm contact with Jannis and Emanuela, make you feel at home immediately. Friends and travelers come and come back again fascinated by the place. All our studios or apartments have private entrance. Our hotel is situated close to the port (3 minutes walking), from the central Market Street as well as from the beach. Languages spoken: Greek, Italian, French and English.